Many of dessert cafe we may found in town nowadays. But how about waffle cafe? 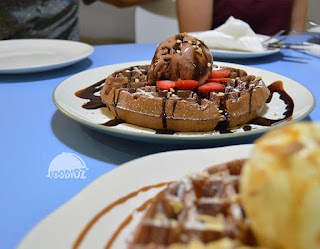 A spot where you could enjoy waffle with various presentation. Brownfox is located around Pasar Minggu area, look carefully while pass through since they don't have a huge fancy brand signage to see from the street. Much better if you're using a map for first time visit. This cafe considerably small space, but it has quite cosey concept with beautiful colorful theme. I've met the owner on this brand, nice young guy with his partner, they are lovely people. We sure talk a lot that time. First waffle come out is the Chocolate Chunk Waffle. 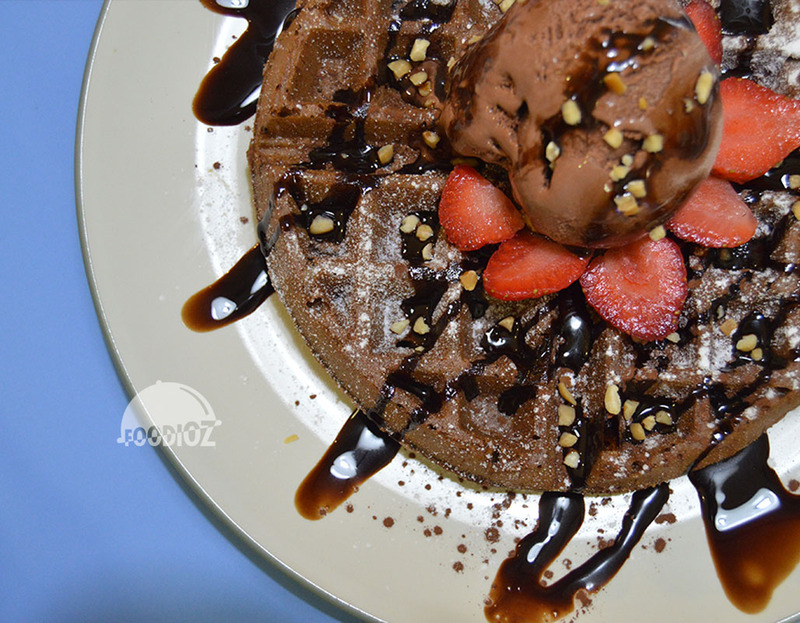 A perfect combination chocolate waffle topped by ice cream, chocolate sauce, strawberry slices and peanuts. Chocolate absolutely my favorite! rich flavor and texture of the waffle sure is delicate and creamy ice cream couldn't be more perfect! 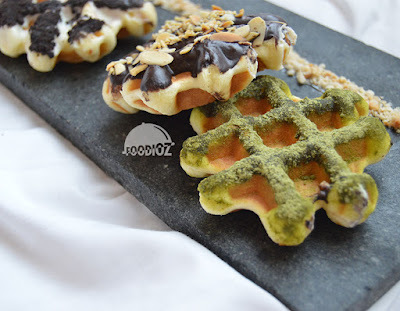 It has perfect waffle dough ever i have try in town. Another variant huge waffle i had is the Salted Caramel Waffle. Vanilla waffle topped by ice cream, poured by salted caramel sauce and rounded almond. Another delightful dish, same consistency dough with the first one. 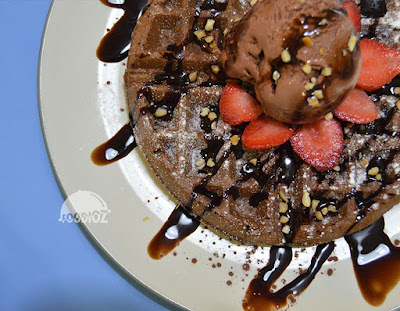 Milky and creamy ice cream such a perfect blend to enjoy this waffle. 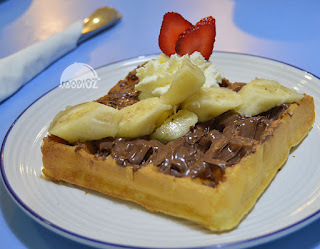 And original crispy waffle i have here is Banana Nutella Waffle. I guess most of you sure attracted by its name. Still in good consistency texture, crispy while it hot. 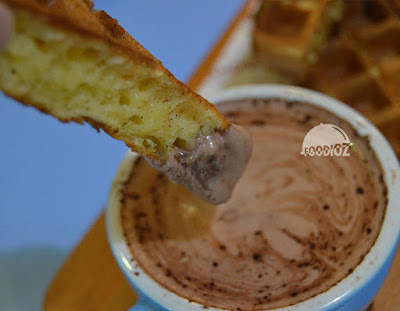 Milky dough and such a good combination with nutella jam and banana slices. But i do prefer the previous waffle though. 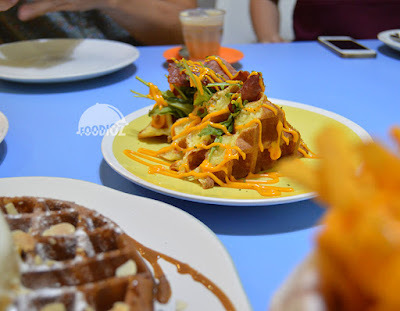 They also offering Savory Waffle, a different ingredient using potato base and topped by various savory toppings. Just like this Cheddar Cheese Waffle. Waffle with cheddar cheese filling and topped by thick cheese sauce and beef bacon. I assure you, this is real savory! A creamy cheese taste sure really up on here plus with the cheese sauce even stronger. We also able to enjoy the Belgian Waffle with different shape and size. It is available in various of flavor we can choose. It has puffy texture and i am sure each toppings are using best ingredient to filled up the premium quality. Other than waffle, we may enjoy a finger snack or sidekick just like this Cheddar Cheese Fries. 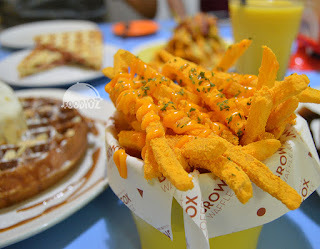 A paper cup filled by stunning fries poured by thick cheese sauce on top. It does looks full and sticky. Or if you'd like a sweet little meal to have, you might pick the Set Meal C with waffle sticks and hot chocolate dip. It such a perfect light meal to enjoy while you're not hungry. You can tell, overall i am sure recommended for you this place. A perfect lovely cosey spot for hang out with some mates. 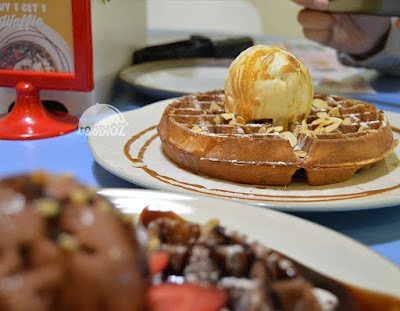 Especially offered by various crunchy based waffle topped by lovely cold ice cream, it is delightful!